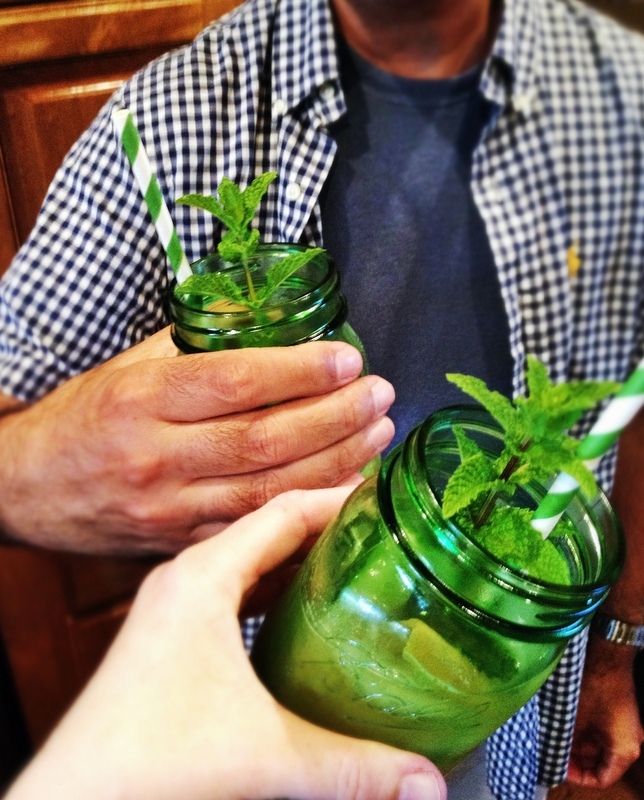 We started our evening fortified with Pimm’s Cups in green canning jars. A good Pimm’s Cup is one of my obsessions. The best version I’ve ever had was served in 2009 at Number Sixteen, an exquisitely stylish and quirky hotel in London. I went there with Last born. The stairs to our room were narrow and steep, angled enough to induce a little thrill of trepidation as we climbed behind a cheerful bellhop lugging our suitcases. But our room at the top of the stairs was lovely, and the Pimm’s Cup served to me later in the ground floor lounge was an experience I’ve been trying to replicate ever since, with mixed results. Last night’s cocktail recipe came from the editor’s letter in the June 2015 issue of Martha Stewart Living. To make it, click here. It’s good, refreshing, and not too sweet with the addition of grapefruit soda. I added fresh mint and a strip of grapefruit peel for garnish, but it did not approach the standard set by Number Sixteen. My hunt continues. We topped our crostini** two ways last night, and each one was a keeper. 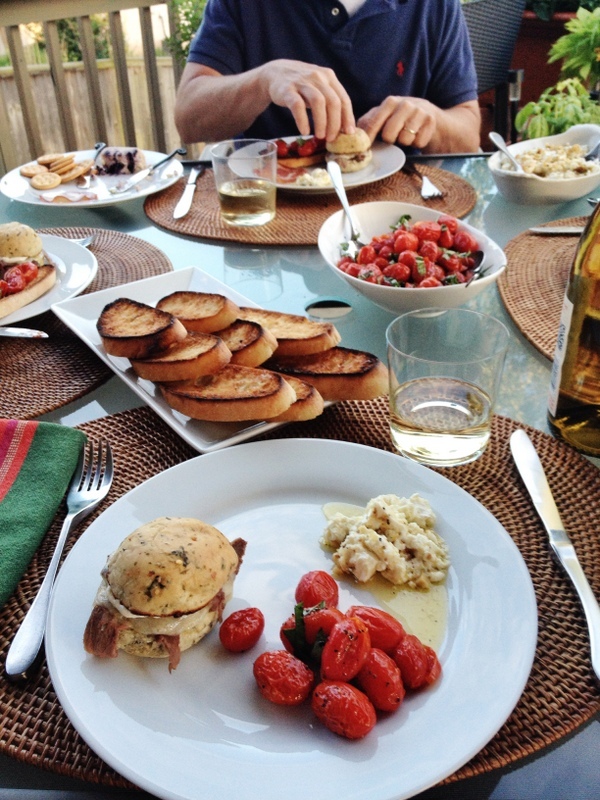 The roasted grape tomatoes were adapted from a recipe by Ina Garten from her cookbook, Parties! (© 2001 by Ina Garten, published by Clarkson Potter/Publishers, New York, NY). I roasted two dry pints of tomatoes, half the amount she calls for. Put the tomatoes on a sheet pan in a single layer. Pour a little olive oil over, just enough to coat the tomatoes as you roll them back and forth with your hands. Season generously with kosher salt and freshly ground black pepper, and bake in a 400°F. oven for about 20 minutes, or until the tomatoes are sizzling. Some of their skins will burst, which you want. Remove from the oven, and sprinkle a couple tablespoons of basil, cut in chiffonade, over the top. J thinks tomatoes cooked this way would work well over pasta, and I agree. The other crostini topper was honey-walnut goat cheese, a dish of sliced goat cheese (cut from a 10- to 11-ounce log), which had marinated for a couple of hours in a blend of 1/4 cup extra-virgin olive oil; 1/4 cup walnut oil; 1/4 cup chopped, toasted walnuts; 2 tablespoons honey, and freshly ground pepper (black or pink or both). Shower with chopped, fresh chives. I loved it; my husband, not so much. If you like tangy flavors tempered with a little sweet, try it. I found the recipe in a booklet of cheese appetizers included with the December 2014 issue of Food Network Magazine. S and I divided the sliced roast beef among eight spinach-feta dinner rolls, each cut in half and arranged on a baking sheet. S covered the meat with provolone cheese, and we broiled the lot until the cheese melted and the cut sides of the top buns were toasty. Some mayo mixed with horseradish provided just the right accent to the finished sandwich. 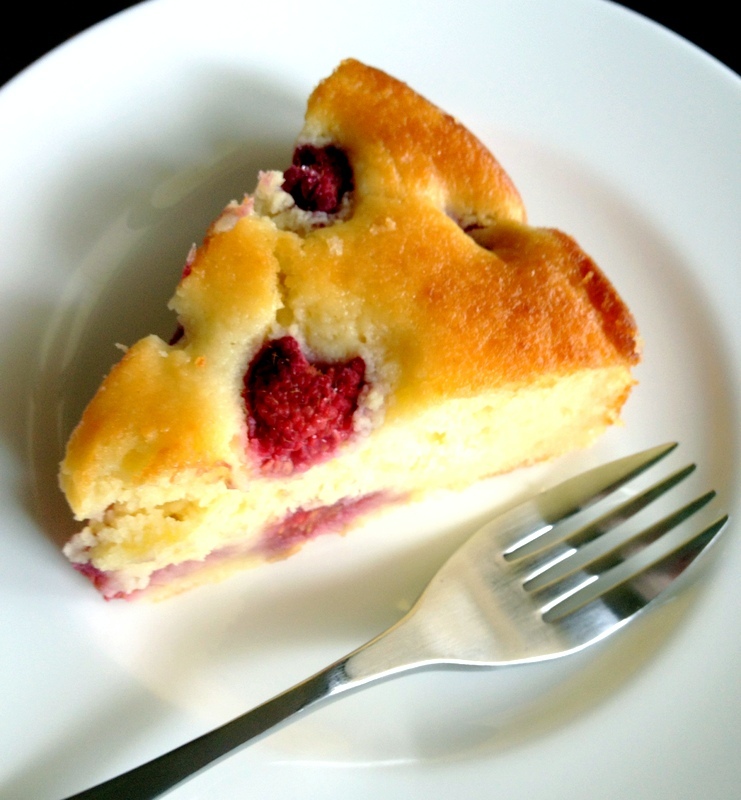 Dessert was Raspberry-Ricotta Cake, recipe available by clicking here. I liked the leftovers even better today. Days of drenching rains have left the turf in our yard spongy and rivers in Arkansas cresting at record heights, but the clouds parted long enough yesterday evening to reveal a blinding, setting sun. We remedied the strong light with a strategically-placed deck umbrella, tilted just so. It was the most complicated issue that arose for the next three hours. **Crostini: Slices of bread (in this case, ciabatta) placed on a baking sheet, tops brushed with olive oil, and broiled until golden brown. (Mine were a little charred but still edible.) Rub the toasted sides with a fresh, peeled clove of garlic, then season with kosher salt.